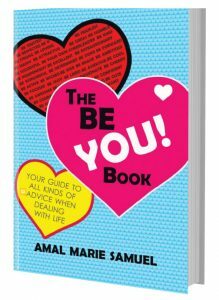 Amal Samuel is an artist and writer who is the creator and advice blogger for thebeyoublog.com. She works in production in the exciting world of TV animation. She has interviewed numerous mentors who have helped shape her career, including Lynn Johnston, creator of the comic strip For Better or For Worse, Suze Orman, author of Women & Money, Stephan Brogren of Degrassi fame, award winning Sam Sandora, of 3 River Studios and many more. When I was writing The Be You! Book, I wanted to interview the people who inspired me when I was a young adult who I thought could give good advice to the young adults today. I chose to contact Lynn as I was a huge fan of For Better or For Worse as some of the main characters in the strip were kids who grew up into adults and had storylines that were similar to what a lot of people experience/go through when they’re young. I got quite a surprise when I received a call from Lynn shortly after I wrote to her company, and she told me that she would like to schedule an interview for my book. That really made my day! Talking on the phone with Lynn was like talking to a good friend whom you could spend hours catching up with. Because I grew up reading For Better or For Worse, I felt a sense of familiarity when talking to her, like I had known her for a long time. She was funny, engaging, and reflective throughout the interview and very down to earth as well which I liked. My dream as a kid was to become a cartoonist as it seemed so cool to be able to create your own stories and jokes and draw at the same time as I loved both comedy and art. So hearing the stories Lynn told me about her career as a cartoonist just brought out the kid in me especially when she talked about the famous people she met or were friends with like Robin Williams, Charles M. Shulz, Bill Watterson, and Jim Davis. I also really liked the advice she gave to young people who were dealing with low self-esteem and how to build more confidence in themselves. I think readers are really going to enjoy her interview in the book. Amazon and Barnes and Noble in the U.S. This entry was posted in News on February 8, 2019 by fborfwnews.